Let's face it ... field trips are BEASTS! Finding one, writing and receiving the approval, planning, the arrangements, and so on ... it's exhausting! And then you have to tackle the costs - transportation, any type of entrance fee, food &/or lodging. Whew! It's no wonder it seems like field trips are few and far between. We are incredibly lucky to be teaching right now. The access we have to amazing places thanks to technology is virtually unlimited! 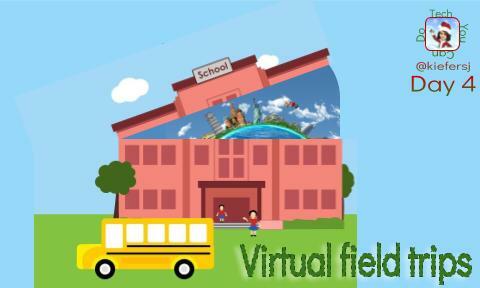 If you've not guessed it by now, today's share is a gold mine of virtual field trips. You can thank Kara Wilkins (@kwilkinstchr) for making it SUPER easy for you to find one - or more - that work for you, your content, and your students! She complied a searchable database on her blog, "To Engage them All", in her entry called "250 Virtual Field Trips ... most of them are free!" Look up your subject area or the unit you'd like to incorporate a virtual field trip in. Better yet - give this to your students and have them research which one(s) they'd like to take and challenge them to explain why they selected it. How cool would that be? Your students can use their researching and evaluation skills and then "defend" their choice. If you do this, I'd love to hear from you! Chat with a Meteorologist? Yes, please! These are NOT the only ones out there ... if you are on social media, throw out requests ... talk to the parents of your own students. You never know when or who will be your next gold mine!